Then it suddenly dawns on you… You’re going to have to answer them. This can absolutely feel like a nightmarish scenario if you’re unprepared. That being said, if you plan ahead, you can appear as though you handle question and answer sessions every day. Below are five rules to ensure the memory with which you leave your audience is a positive one. Depending upon the type of speech in which you’re engaged, you’re going to get various types of questions. For instance, if you’re an authority on a topic and you’re lecturing to a roomful of likeminded enthusiasts, the questions will most likely be directed toward the material you covered or about your credentials. On the other hand, if you’re the personnel manager of a large company and address a group of employees, informing them that there will be a reduction in force in the coming months, the questions you receive will likely be filled with emotion and probably hostile. Using the theme of your speech as a guide, consider the many possible inquiries that could be asked. Then, you can develop effective answers to have at the ready. Not a big fan of questions and answer sessions? If you have the luxury of avoiding them, by all means do so! Not every speech warrants a question and answer session, anyway. And if yours does not, don’t insert one out of a misguided expectation that all speeches must include an opportunity for the audience to contribute. Additionally, if you only have a minute or two, it might be easier for you to simply fill up the remaining moments yourself rather than attempt to elicit a question and satisfactorily reply in the time remaining. Even if the questions asked of you hit a raw nerve, watch your tongue, especially if you’re giving a speech with media in the room. 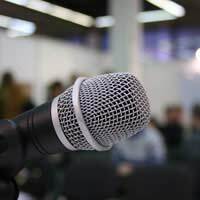 Most journalists are well aware that their best quotes are apt to come from flubbed answers or sudden outbursts during poorly prepared question and answer sessions. Before you give any answer, pause. You can even drink a sip from a glass of water (but only use this trick once or it will start to look peculiar and you’ll find yourself with an urgent need to use the restroom!) Then, you can speak with composure and avoid saying something you’ll regret. Perhaps you relish the idea of engaging the crowd in a rip-roaring question and answer session and can’t wait to react to their inquiries. If that’s the case, it’s acceptable for you to “plant” one or two people in the audience who will ask prepared questions in order to “warm up” their fellow spectators. Just be sure that the questions your “plants” ask can be answered quickly; that way, other listeners will have the opportunity to make queries, too. An audience member asks a very direct question. You have no clue how to respond. Stuttering, you try to bluff your way through it, knowing that you sound ridiculous… and that you made a mistake in trying to answer her inquiry. Speakers aren’t expected to be omniscient; therefore, allow yourself the luxury of saying, “I don’t know, but I’ll find out and get the answer to you,” when you’re stumped. It makes a better impression than attempting to fool your listeners (they’ll know you’re being deceptive), and your honesty will be respected.